Throughout the month of July I have not updated this blog. Of course, with the limited internet access we have in Cuba, plus the fact that our site is blocked by the government so that we can’t access it in the public cyber cafes, I could very well say that I haven’t been able to update is or some similar excuse, but I would be lying… and this space was created specifically to not lie. It is, on the contrary, a refuge to escape from the day to day lie we live. I haven’t written simply because I have not had the state of mind, because I have lacked the push, the faith and the sharp judgment to do it. At times, one loses heart when facing the impossibility of being able to provoke wide-ranging debates which would help change things. Though I can assure you that on the one day last week when I could access the blog, I took advantage of it to read the comments of my readers and the email messages; this always helps and encourages me. Today I sat in front of my computer because I feel worse when I keep silent, and because if we all submerge ourselves in the silence of the lambs, nothing will save us from the shame. It’s as simple as that. What is curious is that sometimes the poverty and social paralysis are more contagious (and much more dangerous) than bravery; many more choose to shut up than to stand up; it is easier to run from reality than it is to face it and transform it. Sometimes it happens that one gets tired of swimming against the current, but after a while of tame immersion, I prefer to get back and continue working my way upstream. Let the flock be silent. What’s curious is the detail that made me mediate about all this: The speech of our current president, Raúl Castro, at the close of the first ordinary session of the VII Legislature of the National Assembly, last July 11. It was a cryptic sermon full of hidden messages, insinuations of promises and premonitions (the granting of land to farmers, hard times approaching, I don’t know if more hard times, or harder even than we have had to live these past 50 years), calls to “fulfillment of duty,” allusions to the absent dictator as if to the Buddha who sees all, hears all, and is consulted on all. In general, nothing convincing or definite, as is often the case in every official speeches. A coded text that can either be interpreted as an old scheme to buy time, or as the intent to oil the rusty old machinery and jumpstart the economy through agricultural production by granting land “in usufruct.” However, if in fact it is the latter, it would mean – despite many limitations and weaknesses – a small step, but an important one in a society so immobilized; discrete but very audacious in a country where for decades everything has been under the strictest control of the State. Neither should we be naïve: Absolute power is highly addictive; one does not renounce it voluntarily and meekly. And what started me thinking is just that. If, during the two years since the forced exit of the older brother, apparent changes and obvious setbacks have occurred; if after Raúl Castro’s speech of July 26, 2007 we are still waiting for the much trumpeted (and missing) “glass of milk” and for the much needed openings; if since February of this year and his official investiture as the President of Cuba and with all this power he so far has not implemented even minimal reforms and we continue as if frozen in time… how could I be disheartened by the supposed uselessness of my humble opinion and those of other romantics like myself? It is crucial to continue to push the door; so let us return to the ring; if the intent is to silence or tire us out, let’s not make it so easy for them. I have decided, finally, to start a new phase. From now on I publicly assume my identity, but will continue using the pseudonym Eva for this blog and for those occasions when I decide to do so. I am renouncing the mask but not the name; I already feel that Eva González is a part of myself and marked an important stage in my life. Without becoming a woman with two personalities, I have become two names in the same woman. I have fulfilled my commitment to those who asked me to unmask myself and now I must fulfill one with myself: To offer my face. 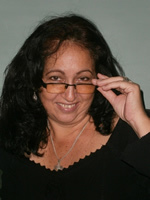 My real name is Miriam Celaya Gonzalez; I was born on October 9, 1959 in Havana. I am, as I had said, an ordinary person: wife, mother of two children and grandmother of a precious baby boy only one and a half years old. I graduated in art history and worked for over 20 years in the Department of Archaeology of the Academy of Sciences Anthropology Centre, which I left of my own accord in August 2005, while directing a research project. Previously I had been a professor of Spanish literature and language. I have never been pampered nor persecuted by this regime, nor do I desire to be the one or the other. I count myself as one of those more than thousands of Cubans who awakened to reality in 1980. The events of that time would mark an important milestone for many members of a generation that had grown up in the naivety of faith in the good intentions of the system, in ignorance about the world around us, in a most rigid indoctrination, and in the belief that we were the elected, predestined to build a better world. We were the happy progeny of a perfect utopia. The events that occurred in the embassy of Peru, the stampede of the Mariel boatlift, the repugnant rallies of repudiation, were among the drum rolls that shook us from our prolonged lethargy. I did not cling to the broken dream, rather I rebelled. That same year I was expelled from the UJC [Young Communist League], which I had belonged to since 1975; every day of my life I congratulate myself on this. For many years I have not been a member of a Committee for the Defense of the Revolution, or been federated with, or a militant of, anything (although I was a member of an opposition party from late 2003 to February 2007). I already had enough. I have experienced in my own flesh that of personal independence is a treasure without price and that individual commitment does not require a call to action. In this journey I have discovered, also, that I am not alone; there are many Cubans who think and feel as I do. A fairly large group of them are working towards the same dream: Another Cuba, one that is safe from dictators, deceptive paternalism, strongmen, and political exclusion. Since December 2004, the date of its foundation, I began to work as part of the editorial board of the digital magazine Consenso. That initial project has transformed itself and taken a more promising and inclusive course. Today we have, in the digital magazine Contodos hosted on the portal Desdecuba.com, a place for citizen journalism destined to support the momentum of civil society in Cuba, and to this I dedicate the major part of my energies. In short, Eva and Miriam are the same thing, there are no contradictions nor antagonisms between the two names. I like the significance of Eva for its symbolism; but much more I like my real name. Miriam means rebel; never could my father have conceived, 49 years ago, of a name more appropriate for me. A young Brazilian colleague asked what does “revolution” mean to me and I discovered to my astonishment that I hardly knew what to say. I babbled a few half empty words, some terminology that often defines the grammatical meaning of the word: Social revolution is a sudden change of a violent nature, a rupture, substituting the power of one class for another, the emergence of new classes of the powerful and of the dispossessed, a transformation… But it has left me thinking about it because “revolution” at least for Cubans, is practically indefinable. In fact, the Cuban revolution has, for a long time, ceased to be one. That is to say, here things have stopped changing for decades, and also for decades the power has been in the hands of the same class: The socialist nouveau bourgeoisie formed from some of the same bourgeoisie of years past and supported by a large group of the mediocre, representing the “proletarian” meritocracy. The most significant transformation that persists is the continued increase in the dispossessed, which now is determined not only by material goods but also by rights. In the end, without meaning to, the young Brazilian colleague put me in a difficult frame of mind. For people like me do not like to think about the revolution; we reject the term naturally and almost unconditionally. We have come to perceive the words revolution and involution as synonyms. On the other hand, at a subconscious level we renounced a long time ago trying to define it. How does one describe with words the phenomenon that for 50 years has absorbed our lives and shaped our destiny as individuals, as a people and as a nation? How does one conceptualize a half century of dictatorship, lies, destruction, false ideology, a myth built on the sacrifice of generations of Cubans? How could one explain with words the widespread poverty and corruption, the institutionalization of lies, fear, denunciation, moral and material deterioration, uncertainty, rupture, loss of values, despair? Revolution is a sick old woman, emaciated, pale and cold; a sad specter muttering premonitions of a holocaust. Nobody sees her, few hear her, a few opportunists even thrive in her shadow, and also there are many (including those and other opportunists) who wait anxiously because, in the end, the outdated old woman rests in peace, forever. Photo courtesy of Xanthi Revueltas. Taken from this site.